The OAG’s ArtWise Council, Gail Bourgeois and the Ottawa School of Art invite you to attend a student-led tour and discussion of the artworks in the current exhibition nichola feldman-kiss: witness. Students leading the tour are: Carol Brodkin-Sang, Andrea Clinton, Assel El-Rayes, Farida Houseiny, Patricia Kenny, Julie Mercantini, Mary Ann Penashue, Delphine Saint-Fort, Debbie Sleeman and Joshua Sullivan. I had the pleasure of facilitating another Reading Out Loud event in the context of the brilliant traveling exhibition, Alma: The Life and Art of Alma Duncan (1917-2004). This retrospective exhibition, organized and circulated by the Ottawa Art Gallery, celebrates Duncan’s lifework in recognizing her as an inextricable part of Canadian art history. 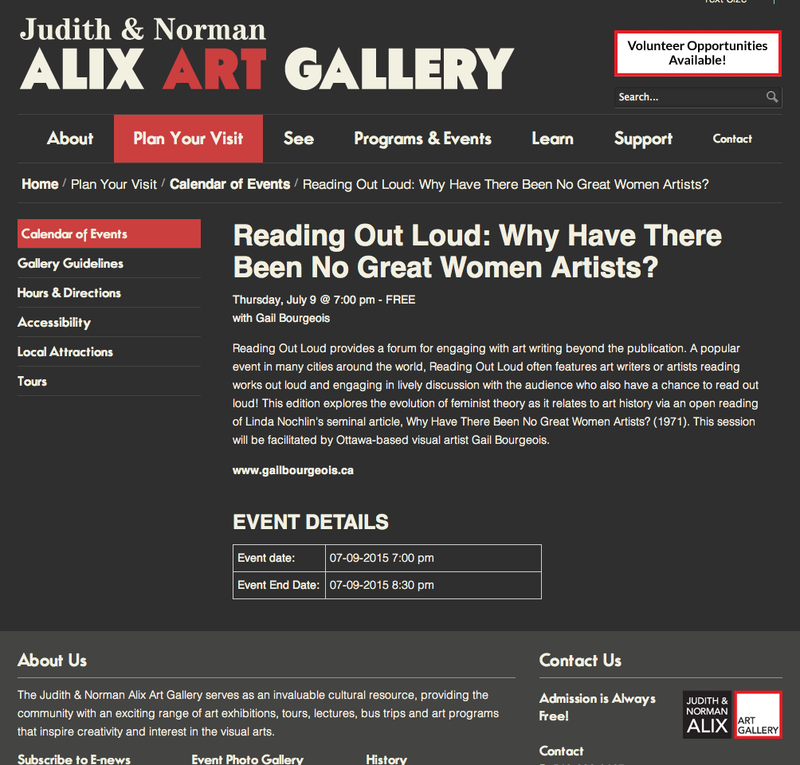 Here is a link to the Judith & Norman Alix Art Gallery. It is so great to see this vital Ottawa-based artists’ collective celebrating their 10 year anniversary ! I initiated and organized a community-based collaborative exhibition project structured through inviting the artists and not by choosing the works. In this way I avoided thinking of myself as a curator and rather as one of the artists participating in an experimental project. 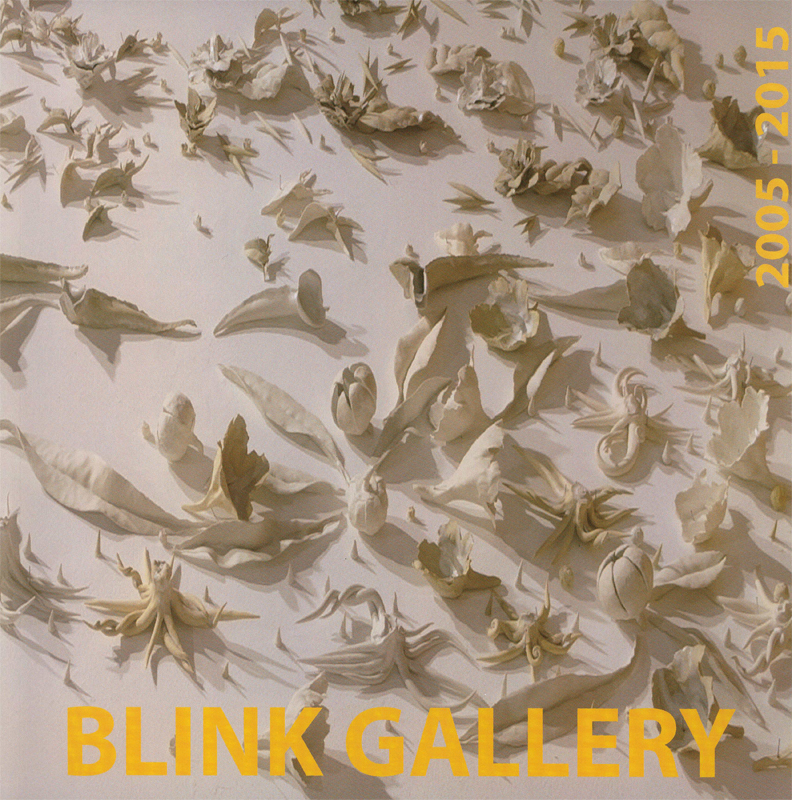 Seventeen artists, professionals paired with junior artists, produced collaborative art works. The art pieces contain the marks and sensibilities of two artists working in close communication. In addition, the project is a partnership between La Fab – Centre des arts, de la culture et du patrimoine de Chelsea (Québec) and the Ottawa School of Art. It brings together artists from two distinct communities with students and recent graduates of the Fine Arts Diploma Program at the Ottawa School of Art. 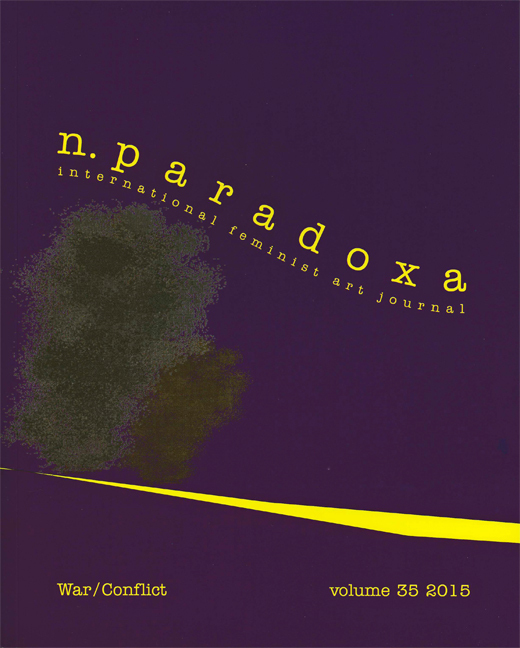 n.paradoxa (ISSN: 1461-0434) publishes scholarly and critical articles written by women critics, art historians and artists which extend feminist art, theory, criticism and history on and about the work of contemporary women artists post-1970 (visual arts only) working anywhere in the world. The editor is Katy Deepwell.